Milwaukee hard wood floor company educates home owners on Mesquite and Spotted Gum types of wood species that can be used successfully for flooring. 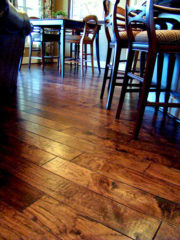 In many cases a wood floor that has lost its luster can be restored with a buff and coat project or a full restoration. The way to find out is to contact Royal Wood Floors and schedule a free estimate where their professionals will evaluate exactly what must be done to restore the hard wood floors natural beauty. In this article we examine Mesquite & Spotted Gum as types of material that can be used for beautiful and long lasting wood floors. The beautiful color of Mesquite is light brown to a dark reddish brown. The grain is high in character, with ingown bark and mineral streaks in it. This type of wood species is most commonly used in flooring as eng-grain block, which has small irregular cracks that radiate across the grain. There is one grade that has moderate color variations. The dimensional stability of Mesquite is excellent. However, in terms of its nailing stability, this type of wood splits tongues easily. When sanding Mesquite, plainsawn can be sanded to a smooth surface. End-grain requires a courser abrasive to flatten; it is recommended that it be flattened by sanding at a 45-degree angle to the grain. With Mesquite there are no known finishing problems that you should be aware of. The end-grain block usage results in a hard high-wear surface and also with this type of species, there are only shorter length boards. It is found in North America and can be limited in quantity. What is Spotted Gum Wood Type? 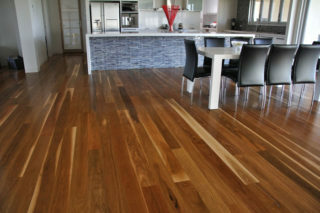 With Spotted Gum, the heartwood is a light to dark brown color. Sapwood is pale and may be as wide as 3.12 inches (8 cm). The grain is interlocked and moderately coarse. A frequent presence of wavy grain produces a “fiddleback” grain that is slightly greasy; gum veins are common. In terms of the workability of Spotted Gum, when nailing, pre-drilling and hand nailing may be preferred. There are no known finishing problems with this type of wood. This type of wood comes from Australia. These types of wood species are both very workable for use in creating beautiful and long lasting floors. “The best way to make sure that your hard wood floors are protected and as beautiful as they naturally can be, is to always do the research first or seek professional help. The types of wood species such as the ones described here can be used to create beautiful and long lasting hard wood floors,” says Allman.